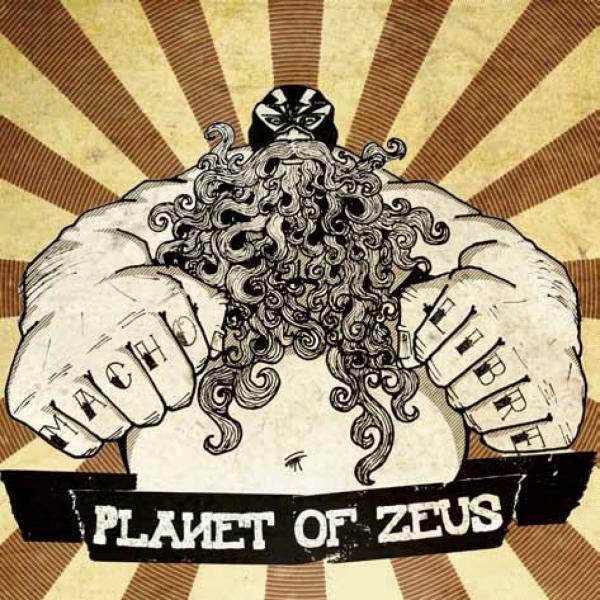 Heavy Planet : Album Review: Planet of Zeus - "Macho Libre"
Album Review: Planet of Zeus - "Macho Libre"
Given Greece's recent political and financial fits, it only makes sense that the public demanded a heavy-handed rock band to compose a soundtrack to play during 2011's demonstrations. What makes little sense to me is how a hillrod four-piece from Athens manages to issue a sophomore effort that any American could fall in love with on a road trip from Louisiana to Death Valley. Macho Libre is equal parts fuzz, moss, tar, and Southern Comfort, set on fire and chased with space candy. Doteru wastes no time in setting a stoner tone fit for a road lizard. Babis's gruff vocals could fill any Big John, while he and Yog trade guitar buzzes and leave Greek highways burned. A sweet, sticky solo punctuates the track, not long before an abrupt fadeout leaves you licking Sriracha from the corners of your mouth. The fretwork on Dawn of the Dead falls somewhere between Dimebag and Zakk Wylde as Syke slaps you with one drumstick and crushes you with another. Choppy and crunchy, the groove is steady until a spacey haze settles over a Dave Wyndorf homage. You'd think a power drill was leading you out the door as guitars and drums plug away and vocals fade. Leftovers teems with twang and C.O.C. vibe, floating on notable musicianship and the abandonment of conventional time signatures. You may detect Orange Goblin here. Then again, you might pay close attention and see one man's sardonic perspective on what's going on in his own country (all with a half-can o' Copenhagen tucked into his muzzle). Hooks and grooves are Macho Libre's bread and butter. The guitars on the title track combine with JayVee's chewy basslines to blow exhaust in your ear and a boil into oblivion is the song's only logical conclusion. Vanity Suit is rolled out more like a storm-cloud than a song, a perfect roll through a hostile small-town bar (where Neil Fallon is your only friend). The Game and Scream stomp straight to your doorstep and jack your jaw with fist-pumping southern metal. There's no way in hell the guitar necks weren't wrangled after this 11-track galumph was complete. Whew. The Alabama Thunderpussy-brashness doesn't quite get its chance to drown the listener in sweat and cheap beer. Tracks like Unicorn Without a Horn and the AWESOME Hazelnut (R.I.P.) are haunting, pensive melancholy wrapped in sufficient subtlety. The guitars echo, pushing the listener along an empty street abandoned by both the forlorn and the hopeful. Hazelnut's distant buzz echoes TooL's Lost Keys (Blame Hofmann) until guitars gulp and gasp. The song moves to marching soldiers, plodding drums, and a whisper of cosmic psychedelia. Planet of Zeus were saving the best for last, you could say. A Greek equivalent of the Mason-Dixon line may not exist, but nobody told these guys. Greece will no longer extract thoughts of gyros, solipsism, or the Parthenon's Doric columns. I'll now think of hollow, distant guitar pleas for Ronnie Van Zant's resurrection. Southern heroes have plenty to be proud of on Macho Libre. They might even get a little jealous. This stuff is thick, deep-fried, and indulgent. yyyyeeeeaaaaah :D We love Planet of Zeus! thesse albums have blown me away ,,,they are classics ,,zeus rule the stoner planet and much much more,,,,sleeping GODS..